Arulnidhi, Remya Nambeesan starred Naalu Policeum Nalla Irundha Oorum audio got released today [Jan 8]. Director Ram officially launched the NPNO music album and the film's team air the songs at Big FM radio station in the afternoon. 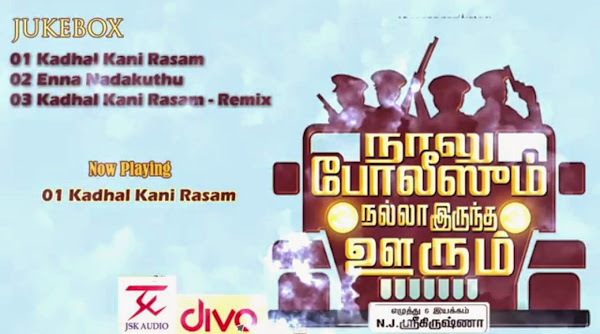 Naalu Policeum Nalla Irundha Oorum is directed by Sri Krishna and produced by Leo Visions. JSK Corporation holds Arulnidhi's NPNO audio and movie distribution rights. Music scored by BR Rejin. The title and posters of the Naalu Policeum Nalla Irundha Oorum have been well received for their uniqueness. This is first time Arulnithi lead in full fledged comedy movie and Arulnithi plays a day dreaming cop. VJ Sabu Joseph takes care of the editing and Mahesh Muthuswami handles cinematography. Comedy Actor Singampuli, Rajkumar and Bhagavathi Perumal are also a part of Naalu Policeum Nalla Irundha Oorum movie’s cast. Naalu Policeum Nalla Irundha Oorum has completed censors with a Clean U certificate. NPNO trailer will be released for Pongal.